What does the Bactrian camel look like? 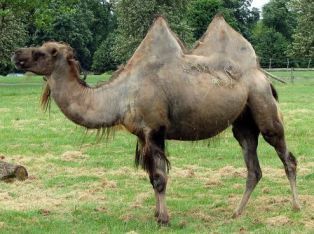 The Bactrian camel is most famous for the two large humps on its back. It is a huge camel that can grow to over seven feet tall at the shoulder! It can grow to over eleven feet long and weight over 2000 pounds. It has a brown fur coat that gets long and shaggy in the winter to help it keep warm in the cold desert. The coat sheds for the summer. Bactrian camels are herbivores, meaning they eat plants. They can eat most any type of vegetation including dry, thorny, or bitter plants that other animals may not want to eat. Their digestive system is tough and they have been known to eat dead carcasses, clothing, and even shoes when extremely hungry. They live in the Gobi and Taklamakan deserts in northern central Asia. They tend to live in groups of 6 to 20 camels. Sometimes they will gather in larger groups near water sources such as rivers. What is the deal with their humps? Camels store fat in their humps. This fat can be converted to water and energy when they haven't had food or water to drink for some time. Once they have used up all the fat in their humps, the humps become thin and floppy. The energy in their humps, as well as other adaptations that help them to conserve water, allows Bactrian camels to go for months without drinking water. A thirsty camel can drink a lot of water, however. Camels have been known to drink over 30 gallons of water in just a few short minutes! Besides having two large humps to help them go without water, Bactrian camels have other qualities that help them to survive in the desert. They have bushy eyebrows and long eye lashes that help protect their eyes from the sand. Their nostrils can close as well to keep out the sand. They also have big, tough footpads that help them to carry heavy packs over difficult desert terrain. These qualities make them the ideal pack animal for travelers crossing the desert. Bactrian camels are classified as critically endangered. This means they are on the brink of becoming extinct. It is thought that there are around 600 of the animals living in the wild, but that their population is on a steady decline. There are two wildlife preserves in the Gobi desert to help protect the species, one in China and one in Mongolia. The males are much larger than the females. Most of the time the camels move slowly, but, if pressed, they can run at speeds of over 60 miles per hour. Most Bactrian camels live for 20 to 40 years with some living as long as 50 years. Wild Bactrian camels tend to be much skinnier than the ones living in captivity. Baby camels, usually called calves, weigh about 79 pounds when they are born. They can walk and run not too long after birth. These camels hardly ever sweat allowing them to conserve water.